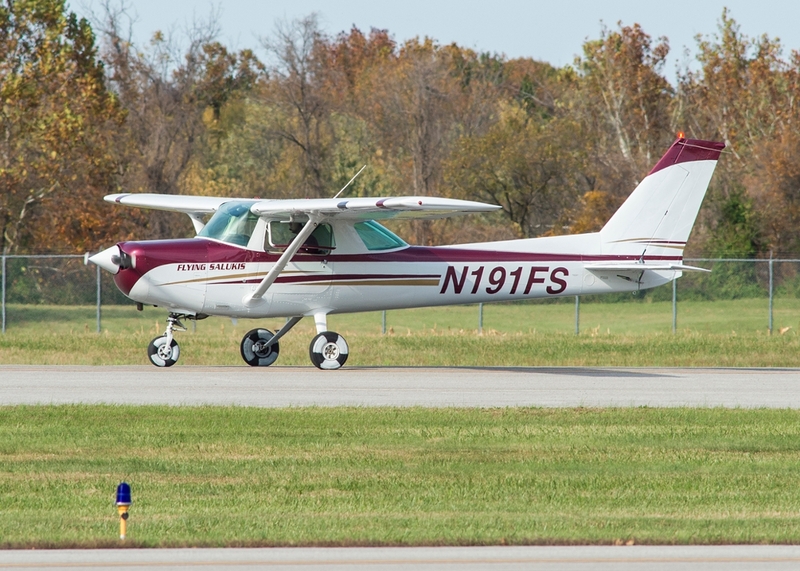 CARBONDALE, Ill. — The Southern Illinois University Carbondale Flying Salukis punched another ticket to the national finals with the team’s eighth straight National Intercollegiate Flying Association Region VIII title Oct. 13 at Purdue University. SIU finished with 382 points and won the ground and air event categories. Purdue University was second with Lewis University third. Results are available at the NIFA website. Nathan J. Lincoln, a senior lecturer in the aviation management and flight degree program, coached the team to two of its national titles. This year’s team is another example of the program’s success. The dominating performance included a clean sweep of simulated comprehensive aircraft navigation, or SCAN, where students plan a cross-country flight and answer multiple questions that include regulations, performance calculations, weather, weight and balance and aeronautical decision-making. The team also placed the top four finishers in computer accuracy and power-off landing events and top three in aircraft recognition and traditional navigation events. Traditional navigation is where pilots and safety observer teammates rely on maps without using GPS. Co-captains Jonathan Ezell and Robert Kay finished first and second, respectively, as top pilot and top scoring contestants. Ezell, a senior in a junior in aviation technologies from LaGrange Park, won the short-field landing event and placed in six others events. Kay, a senior in aviation management from Plainfield, won SCAN and with Brody Wilson won traditional navigation. Aircraft preflight inspection – Trent D. Medernach, senior, aviation technologies and aviation flight, from Batavia. Aircraft recognition – Nicholas G. Weber, senior, aviation management, from Fredericksburg, Virginia. Computer accuracy – Andrew D. Finer, sophomore, aviation technologies and aviation flight, from Des Peres, Missouri. Message drop – Finer (dropmaster) and Warren Wudtke (pilot), senior, aviation management and flight, from Palos Park. Power-off landing – Brody Wilson, senior, aviation management and flight, from Elmhurst. Bloomington: Angel R. Cochran, senior, aviation management and flight. Chicago: Matthew M. Santos, freshman, aviation flight. Crystal Lake: Sean P. Sullivan, senior, aviation management. Geneva: Maxwell J. Hamilton, freshman, aviation management and flight. Maroa: Lukas A. Miller, junior, aviation management and flight. Mount Prospect: Colin J. Heisler, junior, aviation management and flight. Park Ridge: Gavin R. Voris, sophomore, aviation management and flight. South Barrington: Alex W. Evans, sophomore, aviation management and flight. Springfield: Thomas J. Smith, senior, aviation management and flight. Western Springs: Angelina R. Kapp, freshman, aviation technologies and aviation flight. Fayette: Matthew Browning, senior, aviation management and flight. Teddy Keenan, a member of the 2015 national championship team and an assistant instructor in the program, received Coach of the Year recognition. The other assistant coaches are Mike LeFevre and Kendra Wendling, also assistant instructors. Keenan is leaving for the U.S. Coast Guard and his dedication and commitment to the team will be missed, Lincoln said. The title qualifies the nine-time national champions for NIFA national competition for the 49th time in 50 years. The national event is May 13-18 at Southern Wisconsin Regional Airport and hosted by the University of Wisconsin-Madison. The Flying Salukis finished third last year, marking the eighth straight year the team finished in the top three in the nation. The team has national titles dating back to 1977 with the most recent in 2011, 2014 and 2015. Kay, Browning and Wilson will graduate before the national competition. Ezell and Finer will take their place as captains Lincoln said.